Review: Deadpool #1 (2018) - Its About %@#!& Time! 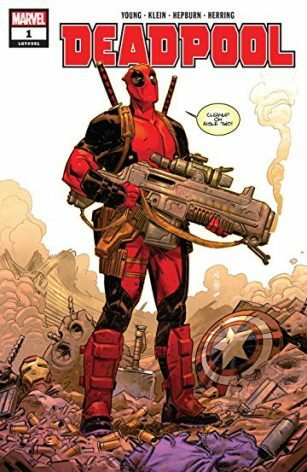 Reviews Reviews from the Dark Side Deadpool #1: It’s About %@#!& Time! Deadpool #1: It’s About %@#!& Time! So, let’s take a walk down memory lane here, shall we? Way back in 2012, way before there was a Deadpool movie, we were introduced to the merc-with-a-mouth by Gerry Duggan and Brian Posehn. Duggan basically carried the series, taking over the writing duties, and directing the ship until his last hurrah in Despicable Deadpool #300. I was a huge Deadpool fan. HUGE. The writing was smart and funny. The art was consistent. It was good. As the run moved on, things started to stagnate. Stories felt reused. They were releasing gimmick books more and more (hello Spanish book?). And I jumped ship sometime in 2015. It just wasn’t the book I signed on for. Then in 2016, the Deadpool movie came out and it BLEW the comics out of the water. Ryan Reynolds’ DP was exactly what the comics should have been. It should have been a hard R rating. It should have been disgusting and irreverent. But it wasn’t. Until now. Skottie Young has been around for a few years now. Mostly known by Marvel comic fans as the guy who created the “baby Marvel” characters, Skottie drew more variant covers than almost any other artist of the time. But what people didn’t realize is that he was a terrific creator as well. His “I Hate Fairyland” series has been going strong since 2015 – showing a sarcastic and maniacal side to his “baby character artist” persona. This is the guy that was handed Deadpool. The guy who’s been working a R-Rated book for the last couple of years. Could it work? It’s About Time. Really. This book IS Deadpool. Ryan Reynolds R-rated Deadpool. It’s funny. It’s 4th wall breaking. It pokes fun at everything (even DC/Batman). It’s pretty darn near perfect. Not much happens in this first book, you learn that Wade is running a new mercenary business with Negasonic Teenage Warhead. A point is made that this seems ripped off from a movie or something. And then Deadpool points out that he had a memory wipe so anything could have happened before. And it doesn’t matter. Because it’s exactly what Deadpool should be. If you, like me, have jumped off the Gerry Duggan train. Jump on to the Skottie Young bullet train. This is going to be a WILD ride.